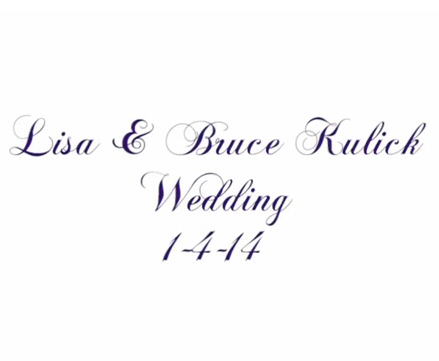 Wedding memories from the union of Bruce Kulick and Lisa Lane on January 4, 2014 in Los Angeles, California. Photos by Rick Gould, with additional photography by Lisa & Gary Bandfield. lyrics by Ann Hampton Callaway. melody composed by Rolf Lovland. In honor of Valentine's Day tomorrow, I wanted to share this video with you. As you know, I married my sweetheart, Lisa Lane, on January 4, 2014. The wedding was perfect, and I have finally compiled the best photos to share with you all. The song you will hear, "I Dreamed of You," I am proud to say features Lisa singing. She really has a terrific voice, and with my jazzy guitar and our good friend Andrew London on piano, this song that Barbra Streisand originally sang for her own wedding made quite the impression on our guests. Let me know what you think of the video and the song, as I plan on recording more songs with Lisa this year. Love has many bonuses, and hearing her sing melts my heart. Don't you all agree?